The Short Ocean Pointscore will commence on 22 September 2018. This will be a 9 race series with the best 6 to count. 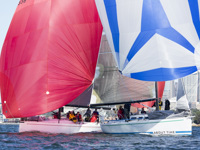 All races will be sailed off Sydney Heads. Whilst there is no one overall winner for the Short Ocean Pointscore, overall and season pointscore trophies will be awarded in both IRC and PHS handicap pointscore categories to 1st, 2nd and 3rd in each division. A Spring Pointscore and an Autumn Pointscore will be conducted within the Short Ocean Pointscore. The Spring Pointscore will comprise all races held prior to Christmas (4 races with the best 3 to count). The Autumn Pointscore will comprise all races held after Christmas (5 races with the best 4 to count). Competitors competing in the Short Ocean Pointscore require a Special Regulations Audit of Category 4.